An In-Depth Review of the 5 best Natural Mattresses From Budget to Luxury. Comfortable, better for your health and less impact on the environment, there can be plenty of reasons why you might be thinking about buying an organic mattress. A bed made with natural materials can be great for those with allergies or environmental sensitivities and can be easier to dispose of, once you decide to move on to a new bed. From cotton to bamboo to natural latex, the world of organic or natural mattresses can be an expensive one, so when you make the big purchase, you want to be sure you are getting one of the best. That’s why we put together this round up of the top organic mattresses on the market, providing a range of styles – from the fully organic bed to those featuring some natural materials, to suit a range of needs and budgets. Choose the feel that’s right for you, whether you are looking for adaptive but resilient latex or the cozy hug of memory foam – read on to find out why we picked these beds as the best. You are looking for a bed that is natural but with springs: The Avocado mattress offers a great combination of innerspring coils and natural latex layers. If you don’t like all foam beds and are going for a gentle firm feel, this could be the natural bed for you. You are looking for a bed with some latex: If you are looking for a bed that contains latex, the Avocado is a nice pick. Made with several layers of sustainably harvested Dunlop latex, this bed is fully natural. You are wanting a competitively priced mattress with a great warranty: For what you get with this bed, the value is incredible. Other similarly structured mattresses are either priced way higher, or have less warranty. Below the cover is a layer of natural New Zealand wool, 1 ounce per square foot, to be exact, which provides a layer of moisture wicking and breathability to the bed, while also making for an extra layer of comfort. This wool is Oeko-Tex Standard 100 certified and even the detergent it is washed with, is 100 percent natural. Beneath the wool is a layer of natural hydrated silica which is a natural fire barrier and a replacement for chemical fire retardants. Next up, we move to the individually pocketed coil layer, which is sandwiched between two natural latex layers. The first is a 2-inch layer of 100 percent natural Dunlop latex. Then comes 8 inches of pocket coils, built in three different zones, designed to be adaptive to different regions of the body, as well as provide edge support. At the base of the mattress is another 1 inch layer of natural Dunlop latex. All of these layers put together make for a total of 11 inches. The Avocado company offers another option for those looking for a more luxurious, plush feel. The mattress comes with an optional Euro-style pillow top, which features a third 2-inch layer of Dunlop latex, providing exceptional comfort and cushioning and a softer feel than their standard version. All in all, either option is a great buy for a natural mattress. Priced very competitively, the company also features a 100-night sleep trial period, including free shipping, free returns and a 25-year warranty. 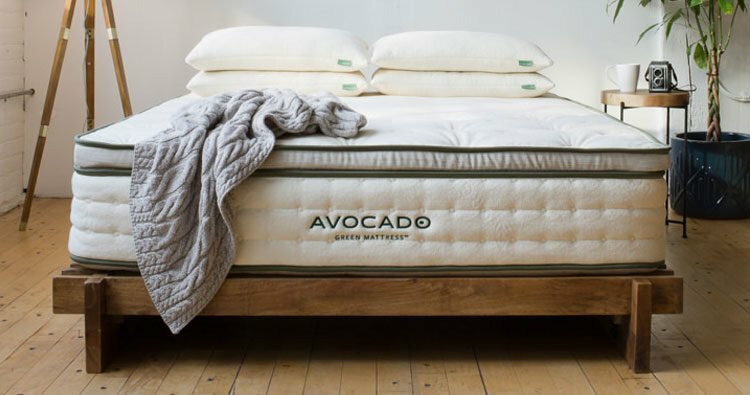 The Avocado Green Mattress is a great option for those looking for a bed with natural, organic materials, but who aren’t fans of an all foam or all latex mattress feel. Combining the best of both worlds, this gentle firm mattress rates as our top hybrid option for natural beds, because of its combination of high quality, organic materials and eco-friendly recycled steel coils. Looking a bit deeper into the Avocado’s natural materials, we can start right from the outside of the bed, with their certified organic cotton cover. Avocado uses a natural organic cotton poly blend in the cover, which is hand button tufted with natural wool yarn. The mattress contains no chemicals, nothing harmful to cause any off gassing and the latex is all sustainably harvested – a pretty attractive option for those looking for a natural hybrid mattress. Read more here to see how the Avocado mattress also rates very highly as a great mattress for heavier people. You want an all-natural, all latex bed: This bed is made with two thick layers of latex and has no other foam layers or innersprings. If you are looking for a bed made with all natural latex, this could be a good choice. You want a customizable level of firmness: Some people reluctant to move to an all latex bed might take comfort in knowing that the company makes a wide variety of mattresses for all types of sleepers, whether you like a firmer or softer, plush bed. You want an all latex bed on a budget: For a bed with organic and natural materials, including cotton, wool and all natural latex, this bed is a great value and a good purchase for those who don’t mind spending on quality, but who don’t want to break the bank. Another fine option in the all-natural, latex bed market, the Botanical Bliss mattress by PlushBeds offers something different, by providing all latex layers and no innersprings. This could be a good pick for you if you are looking for a bed that is latex only. The Botanical Bliss 9-inch mattress comes with two latex layers, one of Talalay latex and one of Dunlop, all wrapped up in an organic cotton cover. Let’s look into the construction a bit further to see why this is one of our top natural options. As we mentioned above, the cover of this mattress is made with organic cotton and below this, similar to the Avocado mattress is a 1 inch layer of pure Joma New Zealand wool, naturally inflammable and breathable. Next, is PlushBed’s first layer of 100 percent natural Talalay latex, at 2 inches thick. It is designed to be a pressure reducing and adaptive layer that supports the body. Underneath this, is another, thicker layer of Organic Dunlop latex and at 6 inches, this provides the high-density support of the bed, which is designed to be comfortable, but firm enough to prevent sagging or body impressions. There are no harmful materials in this bed to cause any off gassing and even the glues used are all natural. It’s a completely safe and eco-friendly option for a bed, at a great value. Another great selling point of the Botanical Bliss mattress is its customizable level of firmness, which allows you to choose between four levels of firmness. So, if you’re someone who likes the idea of an all latex mattress, but is a bit concerned about how soft or firm it will be, talk to one of their specialists and get the firmness level that is right for you. You can also get it in two other heights, for additional plushness, so they literally have a bed made for every type of sleeper. Customers are raving about the cradling, cushioning support of this mattress and the fantastic customer service. The no nonsense return policy and 100-night sleep trial, along with their 25-year warranty compares to the Avocado mattress mentioned above, and users seem to be very happy with this bed that has even won over the more skeptical of customers, who have never slept on latex before. Read more of what we have to say about the PlushBeds Botanical Bliss Mattress here. You want a bed with an all organic option: The Nest Bedding Q3 mattress is one of the few all latex beds on the market that allows you to switch up the latex blend layers for all organic layers. 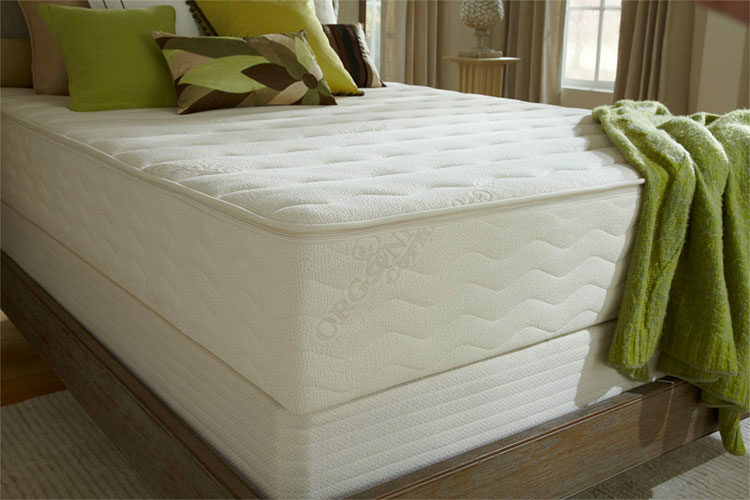 The Q3 is available in all organic or blended latex options, you can choose the bed that suits your need and budget. You want a fully customizable bed in terms of materials and firmness: Not only customizable in terms of what materials are inside the mattress, you can also choose between two levels of firmness and by adding an extra thick layer of latex as a topper, you can turn this medium firm mattress into a soft, plush option. You want a latex bed with a long warranty: Latex is known for being durable and long lasting, but just in case, this bed comes with a great 100-night sleep trial and a 20-year warranty. Another mattress with some customizable features, Nest Bedding’s Q3 Latex Mattress comes with the option of all certified organic materials for that luxurious high end all natural feel that you might be looking for. Available in medium firm or soft, the Q3 is meant to be the right feel for everyone, no matter your sleeping style, and an option for those looking for something completely natural and eco-friendly. The components of the Nest mattress differ, depending on what level of firmness you order. The medium firm option includes 9 inches of Dunlop latex, split into two layers. The soft option adds an additional 3-inch layer of Talalay latex, to add as an extra topper. The bed also includes a layer of PureGrow wool and a cover made of organic blended cotton. Unlike some of the other organic beds on the market, the Q3 takes some assembly on your part, depending on what level of firmness you order and the bed is priced quite a bit higher than some of the other all latex beds we mention here, particularly if you add that extra plush layer to build the soft option. If you order the medium firm option, you will get two separate boxes with one 3-inch layer of latex that needs to be put inside the cover, on top of the other 6-inch firmer layer of latex. For the soft version, you will get an additional box, with the 3-inch soft latex topper, already in its own cover. So, if this sounds a bit fidgety and too much work for you, this is something to consider, before purchasing. That being said, customers report that this bed does, in fact, feel “just right” and that the extra topper in the soft option, gives the bed a bit more of a traditional feel, and less bounce back than the medium firm option. And while pricey, as all organic mattresses tend to be, the cost of this bed can be brought down quite a bit by choosing the “blended latex” option, rather than the all organic components option, which will still give you the benefits of an all-natural latex mattress, but at a lower price. Nest Bedding offers a no risk 100-night sleep trial and a 20-year warranty and for a high quality, fully organic, durable latex mattress, with plenty of customizable features, the Nest Bedding Q3 Latex Mattress is one of our top picks, with plenty of satisfied customers. 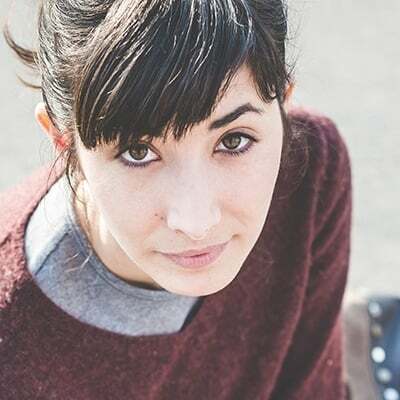 You want a flippable mattress with two firmness levels: Having two firmness levels in one mattress removes the guessing game that comes with purchasing a mattress online. With one side satisfying over 80 percent of customers, there is a side that should suit most sleepers. You want a long warranty: A great sleep trial of 120 days and a lengthy 20-year warranty, this bed is not as cheap as a petroleum based foam mattress but for the price you get great value, here. You want an all-natural latex mattress: Fully natural, this bed contains organic wool, organic cotton and naturally sourced latex, sourced right from the tree and formed in America. It’s a healthy, resilient and durable option. Zenhaven also offers a customizable level of firmness with their latex mattress, but no assembly. Their mattresses are flippable, with a luxury plush and a gentle firm side, so there is something for everyone. In fact, they suggest that 80 percent of latex customers will choose the luxury plush side and also mention that the gentle firm side is 18 percent firmer than the other side, but still soft enough to be pressure-relieving. Zenhaven is one of the mattresses on offer from the familiar Saatva company, and they offer something different in their latex layers, as they are covered in holes throughout, of varying size and spacing, to provide 5 different regions of density. This is supposed to give you more support under your torso and shoulders and softer support in other places. The company chose Talalay latex for their bed, which they harvest sustainably from tropical rubber trees and they say it is more resilient than Dunlop latex and provides a supple, yet buoyant feel. American made Talalay is natural hypoallergenic and contains no volatile compounds or harmful substances. Not only that, but the way that Zenhaven manufactures their latex is entirely water based and by making it in America, instead of Asia, they are keeping their carbon footprint down and making their product eco-friendlier. But the naturally harvested latex is not the only natural feature of this bed. Both sides have a flame-resistant barrier, made from 100 percent organic New Zealand wool, chosen not only for its natural properties, but for its ability to be naturally moisture wicking and antibacterial. The cover itself is also made of quilted, organic cotton and promotes the mattresses breathability. Next comes the latex, mentioned above – and the Zenhaven mattress actually contains four layers of latex – two comfort layers and two support layers. The two comfort layers are 1.5 inches of latex each and they sandwich the two support layers in the centre, that are 3 inches each. This is what provides the wonderful flippability of the Zenhaven mattress. Each support layer of latex has a different level of density, meaning that one side can be firmer than the other. Customers are raving about these two firmness levels, and they are happy they can get essentially two beds in one, with a near guarantee of satisfaction. Zenhaven can also boast over 12,000 five star reviews from various sites, so there is something to be said for that. They also blow many of the other natural mattress sleep trials out of the water, at 120 days and with a 20-year warranty, there isn’t really much that can go wrong, here. We have a bit more to say about this bed, and you can check it out here. You want a natural memory foam bed: If you’re wanting a memory foam bed made with natural materials, look no further than this mattress, which has soy and corn oil replacing up to 40 percent of the petroleum based foam, which, for memory foam, is great. You want a choice in firmness level: One of the common issues with memory foam is the sinkage and some people feel it can be too soft. With Loom & Leaf’s two firmness options – relaxed firm and firm – you can be sure you are getting a supportive bed with the nice cushion of memory foam. You are on a budget: For those with tight purse strings, the Loom & Leaf mattress is one of the most reasonable priced natural memory foam beds on the market. Considering its high end materials and long warranty, this bed packs a great amount of value. A more affordable option is to go with a bed that isn’t fully organic, but has some natural materials. Enter the Loom & Leaf mattress, also by Saatva and a great option for those who want some natural materials but can’t afford to go all out on the Zenhaven bed. A fantastic pick for those who want to get away from an all latex bed and prefer the feel of memory foam, the Loom & Leaf mattress offers multi layered construction, built with eco-friendly materials. Starting at the top, is the quilted organic cotton cover that other high end natural mattresses come with. Breathable and naturally retardant, as it is infused with plant based thistle, cotton is moisture wicking and antibacterial. Below this is Loom & Leaf’s proprietary cooling spinal gel layer, providing support for the spine, while alleviating some of the heat issues that memory foam can cause. Next down is a 5-pound layer of eco-friendly memory foam. CertiPUR-US certified and made with no harmful chemicals, this is about as natural as you can get for a manufactured memory foam. In fact, Loom & Leaf mattresses remove about 30-40 percent of the petroleum out of their foams and replace with soy and corn oil as part of their strong green initiative. They also don’t use any formaldehyde and their foams have no off gassing so there is little to no smell after setting up your bed. Below the memory foam layer is a dual layer of breathable support foam, also just as eco-friendly as the other layers. 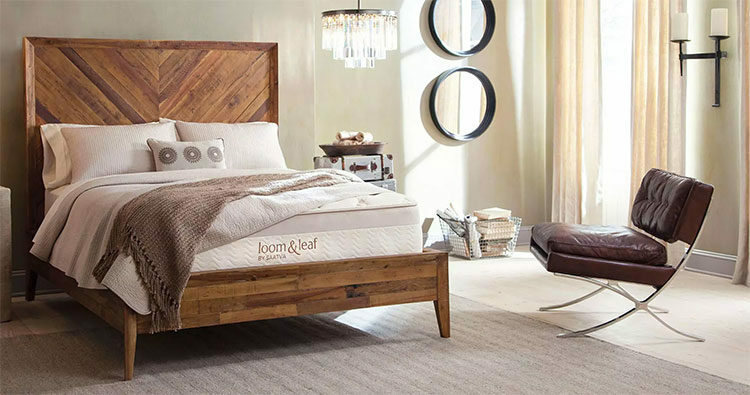 Another nice option, Loom & Leaf offers two comfort levels – relaxed firm and firm – with relaxed firm being their “middle of the road” choice (not too hard and not too soft) and their firm option there for people who want a memory foam bed but need a bit of a firmer feel. This mattress has a high level of satisfaction, at over 80 percent and is a great option for those who want a memory foam bed, as healthy and natural as possible. 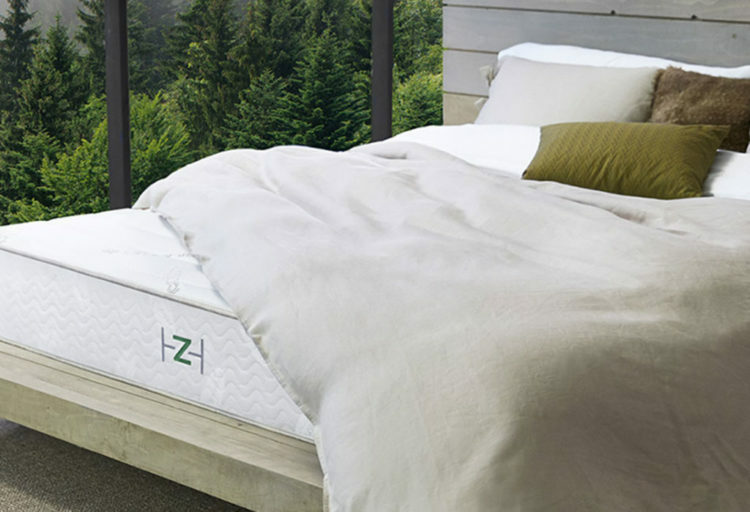 Offering that same 120-day home trial as the Zenhaven and a decent 15-year warranty, this is our top memory foam pick in mattresses with some natural materials. We have a bit more to say about the Loom & Leaf mattress and you can check out our pros and cons here. Whether you want the responsive, bounce back feel of latex, the supportive, resistant bounce of innerspring or the comforting hug of memory foam, there is a natural option here, for everyone. Yes, an all-natural or all organic mattress is going to be quite a lot more expensive than a regular ‘ol bed, but the health benefits are hard to dispute. No harmful gasses, plant based materials to lay on and less of a carbon footprint, maybe now is the time to invest in a bed good for your body, inside and out.